Located in beautiful Kissimmee, Florida, Gaylord Palms Resort & Convention Center is an ideal hotel for luxury, comfort and superior amenities. 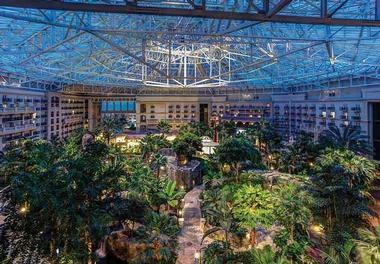 Singles, couples, business travelers and families will all find something just for them at Gaylord Palms. The resort stretches out over 63 acres and offers guests so many things to do, they may never have to leave the grounds. However, being only 10 minutes to Disneyland, as well as other popular sightseeing interests, guests may want to venture off site for fun-filled days as well. The resort boasts an astounding 1406 guest rooms, which are available in various sizes and configurations. There is a spa on-site, a large waterpark for families and especially the children, to enjoy, dining options for guests to consider and plenty of space to sprawl out and explore. The St. Augustine Atrium, a gorgeous indoor, tropical looking paradise, will whisk guests away to a relaxing, tranquil place. 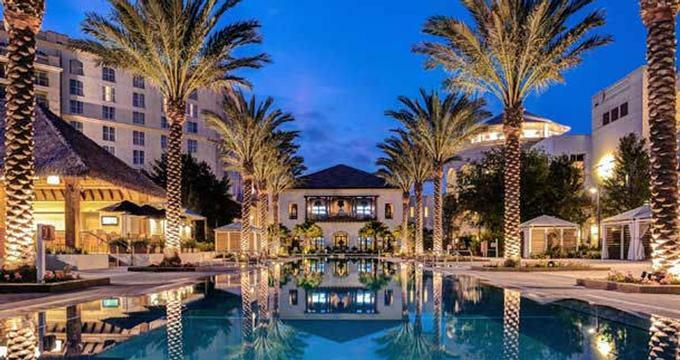 The palm trees, cobblestone pathways outlined with lights, and the small-scale replica of an old Spanish fort, complete with treasures, gives the resort an old world charm fused with a tropical resort environment. Some rooms boast a view of this stunning atrium from a private balcony. 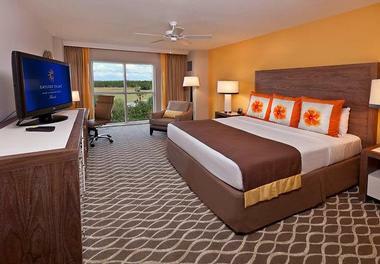 With 1406 guest rooms available, it is easy to find the perfect room to suit any budget, need or preference. There are four room categories to select from, some offering views of the atrium. These include Guest Rooms, Emerald Bay Rooms, Executive Suites and Deluxe Suites. Guest Rooms are available either as a standard guest room or one with an atrium view. Bedding configurations include one king or two queen beds. They are each 410 square feet of comfortable living space. The atrium view rooms feature a small balcony with chairs to enjoy the view of the indoor atrium. The Emerald Bay rooms also come with standard or atrium view option. They both offer either one king or two queen size beds. It is important to note that these rooms do not come with accessible features should guests require such amenities. Connecting rooms are available for some of the Emerald Bay suites. Executive Suites range from 625 to 725 square feet of living space. They come complete with a living room/sitting area which is separated from the bed area by a privacy wall. These suites offer one king size bed plus a sofa bed, allowing up to four guests per room. Also, the Executive Suites are equipped with two phones and two televisions plus a balcony area for sitting. For the ultimate in luxury and comfort, guests can choose a Deluxe Suite, which can range in size from 830 to 960 square feet. It offers a king size bed in a separate bedroom, plus a pull out sofa bed in the living room area. There are two walk outs to private balconies for added space and more places to relax. There is a wet bar, which is perfect for entertaining. An additional feature of the Deluxe Suite is the roomy dining room table and chairs, seating up to eight people. The maximum occupancy of the Deluxe Suite is four guests. 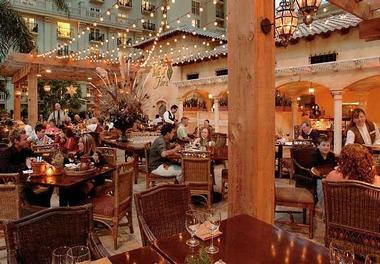 There is no shortage of dining options available at Gaylord Palms Resort & Convention Center. Guests will never have to leave the resort to find something they enjoy, and which is prepared fresh. For breakfast, lunch and dinner, guests will surely find something at one of the many dining venues on-site. Old Hickory Steakhouse serves dinner daily in a smart casual atmosphere. It is recommended to make reservations since this restaurant is one of Kissimmee’s finest steakhouses and is open to the public as well. Juicy steaks and fine wines are on the menu at Old Hickory Steakhouse. They support local farms and sustainable, organic farming. Moor is a haven for the seafood lover. They pride themselves on their fresh, locally sourced menu items which taste fantastic. Moor is open for lunch and dinner daily and will tantalize the taste buds with the many locally inspired dishes they offer. Villa de Flora is a Mediterranean restaurant which is open daily for breakfast and dinner. It is set in what appears to be a European villa which adds to the old world charm and atmosphere. Their brunch has won accolades from local newspapers for being one of the best in Kissimmee. Dinner offers a buffet of seasonal menu options that span a large chef’s table, offering breads, meat entrees, pasta and desserts, all inspired from the Mediterranean culture. All of this deliciousness is served in a casual atmosphere. Sora offers sushi in a casual setting for dinner each day. Their sushi rolls and sashimi are sure to please any sushi aficionado. The lounge is a popular gathering spot to relax, unwind and enjoy cocktails with friends. SandBar is conveniently located next to the outdoor pool, serving lunch and dinner daily in a casual, laid back atmosphere. This delicious restaurant serves up American cuisine and allows guests to continue enjoying their fun in the sun while having a meal on the go. Both lunch and dinner are served at SandBar, and there is also a Kids Menu available. Serving breakfast, lunch and dinner, the Cocoa Bean coffeehouse is the perfect place for guests to grab something light including Starbucks Coffee. Items available include pastries, sandwiches, wine and beer as well as coffee and tea. Emerald Bay Marketplace is open at various times, but they offer delicious sandwiches in a grab and go style. Guests can also choose from wraps, pastries, warm sandwiches and desserts. Wines, beers and Starbucks coffee are also on the menu. For a cool, sweet treat, Honeybells Frozen Yogurt is the ultimate choice. The hours vary, but guests will enjoy grabbing a cup and filling it with whichever flavors and toppings their hearts desire. Guests will have fun making their own creations and will be back to make more throughout their stay. At Gaylord Palms Resort, guests always have the option of in-room dining. This is available for breakfast, lunch and dinner on a daily basis. Breakfast is available from 5:30 a.m. to 11 a.m. and offers classic breakfast items, lighter choices as well as full family style breakfasts for up to four guests. The all-day menu is available from 11 a.m. to midnight and features soups, sandwiches, mini-bites, pizza and pastas. The dinner only menu starts at 5 p.m. until midnight and has hearty selections such as steak, salmon, lamb and roasted chicken. Dessert is available for both the all-day menu and dinner menu. 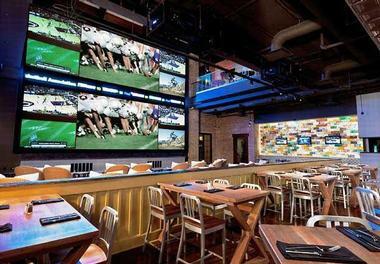 Sports fans will thoroughly enjoy Wreckers Sports Bar on-site at Gaylord Palms Resort & Convention Center. Guests can sit back in a casual atmosphere and watch the game on the giant two-storey, 37 foot sports screen, plus an additional 50 HDTV’s. They boast a delicious pub fare style menu with such items as their signature lollipop wings and mini-sliders. The tub style chairs are comfortable and relaxing, as well as the casual cushioned bench seating on the lower and upper levels. They are open from 11 a.m. until about 2 a.m. with their food menu available from 11 a.m. to midnight. For drinks poolside, SandBar is the place to get fruity cocktails and slushy drinks. Even if guests prefer wine or beer, SandBar can oblige. For the kids, there is a “Mocktails” selection so they too, can enjoy a cool, refreshing drink in the sun. Sora boasts handcrafted, fusion style cocktails in a fun, eclectic environment. Guests will love to gather in the lounge and mingle. It is a favorite meeting spot for everyone who has been. The Cocoa Bean serves beer and wine, which guests can enjoy while overlooking the St. Augustine Atrium. It is a spectacular view, right inside the resort. Relache Spa at Gaylord Palms is the perfect place for guests to unwind and allow complete relaxation to take over their body. With the abundance of treatment options, guests will leave feeling soothed, calm and peaceful. The spa was awarded four stars by Forbes Travel Guide for exceptional professionalism and total soothing journey. Guests can opt for body treatments, facials, manicures and pedicures as well as many massage options. Guests can also book spa packages which incorporate multiple services or even overnight spa retreats. At the salon within the spa, guests can have their hair sculpted and cut by professional hair designers, including coloring treatments. Men are not forgotten at Relache Spa; there are treatment options geared towards just them. Some of the signature treatments available include the Botanical Body Ritual, the Bamboo Fusion Massage and Tropical Island Glow. Pregnant women can also enjoy the Pre-natal Massage. Relache Spa is happy to welcome Wedding parties as well as groups, however it is recommended that advance reservations be made. Kissimmee is a wonderful place for golfers to enjoy a few rounds of their favorite pastime. With three courses under three miles away from Gaylord Palms, golf enthusiasts will be able to get out and easily enjoy a day of golf closeby. Celebration Golf Club is just under three miles away and offers golfers of all levels a challenge in a natural park-like setting. It offers 18 holes of golf, a dining venue plus a practice green. Falcon’s Fire Golf Club is just under two miles away from Gaylord Palms. It offers a beautiful, pristine course for public play as well as having an on-site restaurant for exquisite dining. Hawk’s Landing Golf Club is just a little more than two miles away and showcases a lush green course outlined in thick palm trees. It is fun, yet challenging for all levels of play and features aromatic flower beds and local native wildlife. It boasts modern architecture and well-manicured fairways. 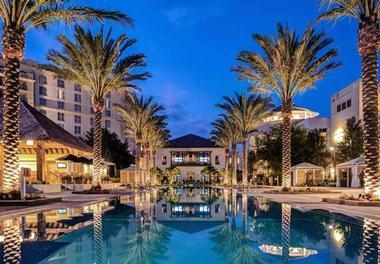 Families with children will love staying at the Gaylord Palms Resort & Convention Center. The on-site Cypruss Springs Family Fun Waterpark is enough to keep children occupied all day, every day. The zero-entry pool is perfect for young children and the four winding water slides will have older children squealing with joy. The treehouse playground with an oversized tipping bucket of water is great fun for the entire family to get soaked. The waterpark is exclusively for guests staying at Gaylord Palms, keeping line ups and crowds to a minimum. There is an arcade for children to enjoy their favorite games. They simply load up a game card to insert into the machines; the better they play the more prize tokens they can win. Kids dining in the restaurants at Gaylord Palms can dine from the kids menu which features many kids classic favorites with a healthy twist of course. As well, children will be given table activities to keep their little hands and minds busy at play while waiting for the meal. For parents looking for an evening to themselves, or if needing to attend business meetings, Gaylord Palms offers “Kids Nite Out”, an in-room child care service which is completely customized to the age of the children. A trained staff member will come directly to the suite with books, games, movies and other fun activities for the children so that Mom and Dad never have to worry. Reservations for this service can be made through the concierge staff. The staff at Gaylord Palms Resort & Convention Center are always excited to assist in planning an event, whether a business convention, family reunion or a beautiful wedding. With over 65 different event rooms, guests will be sure to find the perfect match to the even they are hosting. Weddings are memorable and stunning at Gaylord Palms, with the lush greenery of the St. Augustine atrium as a backdrop. Brides and grooms will love the space they have to create just the day they have always dreamt of. There are many other venue options should couples wish to choose something other than the atrium. Along with beautiful ceremony sites, there are elegant, regal banquet facilities as well. The on-site chef is pleased to offer catering options to please the palate of even the most discerning foodie. Blocks of rooms may be booked for guests of the wedding, which can be tracked and E-mailed to the couple so they too, may keep track of who has booked for their wedding day. The staff are extremely helpful in putting together seating charts and table arrangements as well. There is no detail left out at Gaylord Palms to create the most stunning, unforgettable wedding day a couple could imagine. 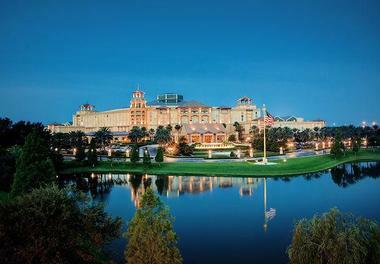 Meetings and other events are gladly welcomed at Gaylord Palms Resort & Convention Center. With over 400,000 square feet of flexible event space, finding the perfect site for a meeting or convention at Gaylord Palms is a breeze. The on-site business center is extremely helpful in planning seamless business events with use of top notch audio/visual equipment and special lighting, catering for the entire group and even arranging team building activities. Event planners will be stress-free with the assistance of the Gaylord Palms staff to ensure their meeting or convention goes off without a hitch. Gaylord Palms Resort & Convention Center has everything guests could want or need under one roof, from shopping to entertainment to dining. Guests will enjoy the adults only pool, the South Beach Pool, which is a tropical oasis away from the hustle and bustle of the waterpark area. The state-of-the-art fitness center allows guests to stay on track with their workout regime even while vacationing. It is accessible 24 hours a day with a room key, and features many cardio machines as well as strength training machines to give guests the workout they are looking for. While working out, guests can enjoy the majestic view of the resort through floor-to-ceiling windows or opt to watch television on the personal HDTV screens found on each cardio machine. If guests are arriving by plane, there is a 24 hour airport shuttle service which can be arranged for a small fee to transport guests and their luggage from the airport to the resort or the other way around upon departure. 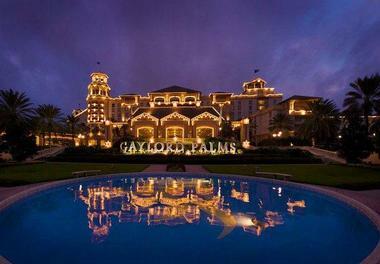 Included with each stay at Gaylord Palms is a free shuttle service to Walt Disney World and other Disney areas. Shuttles to Sea World or Universal Studios can be arranged with at least six hours notice and are charged at the rate of $21 per person.